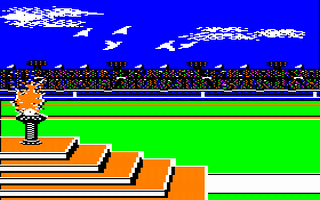 Play Summer Games II online with Apple II browser emulation for free! 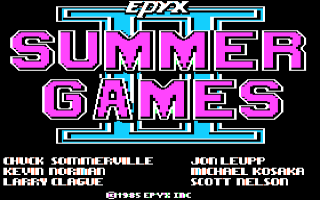 Summer Games II (APPLEII) game rom is loaded with features in our flash, java and rgr plugin emulators. Nothing to configure, we've done it for you! 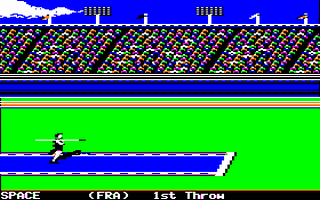 Eight Olympic events feature in this game, and any selection of these can be played at a time. There is no pure sprinting, and only the rowing and cycling can be thought of as pure joystick-waggling. The triple jump involves pressing right to start the hop (before reaching the white line), right again for the step as you land, left as you land for the jump, and then up to propel you through the sand. I high jump, after selecting a height you feel you can clear, you use up and down to control the speed, fire to jump, and then forward to propel you over the bar. For the javelin even you hold down fire to build up speed, and push left to throw the javelin, holding it left before releasing to change the angle. In the equestrian event, you must use up to increase speed, and fire or right to jump when appropriate to clear the hazards - too many faults will see you disqualified. Fencing involves moving your foil using the joystick, always staying one step ahead of your opponent, retreating when appropriate. The kayaking event involves navigating a river by controlling the direction, ensuring that all the gates are past correctly even when this requires some precise lining up. You can also load the events from Summer Games 1 in, to play all 16 events in a marathon session.